BPPV is the most common vestibular disorder. WHAT HAPPENS DURING A BPPV EPISODE? BPPV is a mechanical problem in the inner ear. It occurs when some of the calcium carbonate crystals (otoconia) that are normally embedded in gel in the utricle become dislodged and migrate into one or more of the 3 fluid-filled semicircular canals, where they are not supposed to be. When enough of these particles accumulate in one of the canals they interfere with the normal fluid movement that these canals use to sense head motion, causing the inner ear to send false signals to the brain. Figure 1: Inner ear anatomy. Otoconia migrate from the utricle, most commonly settling in the posterior semicircular canal (shown), or more rarely in the anterior or horizontal semicircular canals. The detached otoconia shift when the head moves, stimulating the cupula to send false signals to the brain that create a sensation of vertigo. © Vestibular Disorders Association. Image adapted by VeDA with permission from T. C. Hain. Fluid in the semi-circular canals does not normally react to gravity. However, the crystals do move with gravity, thereby moving the fluid when it normally would be still. When the fluid moves, nerve endings in the canal are excited and send a message to the brain that the head is moving, even though it isn’t. This false information does not match with what the other ear is sensing, with what the eyes are seeing, or with what the muscles and joints are doing, and this mismatched information is perceived by the brain as a spinning sensation, or vertigo, which normally lasts less than one minute. Between vertigo spells some people feel symptom-free, while others feel a mild sense of imbalance or disequilibrium. Check out the American Academy of Otolaryngology-Head & Neck Surgery's BPPV Clinical Practice Guidelines. It is important to know that BPPV will NOT give you constant dizziness that is unaffected by movement or a change in position. 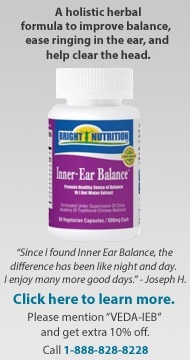 It will NOT affect your hearing or produce fainting, headache or neurological symptoms such as numbness, “pins and needles,” trouble speaking or trouble coordinating your movements. If you have any of these additional symptoms, tell your healthcare provider immediately. Other disorders may be initially misdiagnosed as BPPV. By alerting your healthcare provider to symptoms you are experiencing in addition to vertigo they can re-evaluate your condition and consider whether you may have another type of disorder, either instead of or in addition to BPPV. BPPV is fairly common, with an estimated incidence of 107 per 100,000 per year2 and a lifetime prevalence of 2.4 percent3. It is thought to be extremely rare in children but can affect adults of any age, especially seniors. The vast majority of cases occur for no apparent reason, with many people describing that they simply went to get out of bed one morning and the room started to spin. However associations have been made with trauma, migraine, inner ear infection or disease, diabetes, osteoporosis, intubation (presumably due to prolonged time lying in bed) and reduced blood flow. There may also be a correlation with one’s preferred sleep side4. WHERE SHOULD I SEEK HELP? Your family doctor may suspect BPPV from the symptoms you are describing, since it is very commonly triggered by things like rolling over in bed, getting in and out of bed, tipping the head to look upward, bending over, and quick head movements. However, they may or may not be familiar with the testing or treatment of BPPV, or may only be familiar with management of the most common form of BPPV but not the rarer variants. General practitioners typically refer patients to a medical professional specifically trained to deal with vestibular disorders, most commonly a vestibular rehabilitation therapist (typically a specially trained physical therapist, but occasionally an occupational therapist or audiologist) or an ENT (ear, nose & throat specialist) who focuses on vestibular disorders. Sadly, some doctors are not aware that highly effective treatment is available and tell patients that they just have to live with the condition and hope that it reduces or resolves on its own, which is not in line with best practice5. Normal medical imaging (e.g. an MRI) is not effective in diagnosing BPPV, because it does not show the crystals that have moved into the semi-circular canals. However, when someone with BPPV has their head moved into a position that makes the dislodged crystals move within a canal, the error signals cause the eyes to move in a very specific pattern, called “nystagmus”. The relationship between the inner ears and the eye muscles are what normally allow us to stay focused on our environment while the head is moving. Since the dislodged crystals make the brain think a person is moving when they’re not, it mistakenly causes the eyes to move, which makes it look like the room is spinning. The eye movement is the clue that something must be happening mechanically to move the fluid in the inner ear canals when it shouldn’t be. The nystagmus will have different characteristics that allow a trained practitioner to identify which ear the displaced crystals are in, and which canal(s) they have moved into. Tests like the Dix-Hallpike or Roll Tests involve moving the head into specific orientations, which allow gravity to move the dislodged crystals and trigger the vertigo while the practitioner watches for the tell-tale eye movements, or nystagmus. There are two types of BPPV: one where the loose crystals can move freely in the fluid of the canal (canalithiasis), and, more rarely, one where the crystals are thought to be ‘hung up’ on the bundle of nerves that sense the fluid movement (cupulolithiasis). With canalithiasis, it takes less than a minute for the crystals to stop moving after a particular change in head position has triggered a spin. Once the crystals stop moving, the fluid movement settles and the nystagmus and vertigo stop. With cupulolithiasis, the crystals stuck on the bundle of sensory nerves will make the nystagmus and vertigo last longer, until the head is moved out of the offending position. It is important to make this distinction, as the treatment is different for each variant. Figure 2: The right Dix-Hallpike position used to elicit nystagmus for diagnosis. The patient is moved from a seated to a supine position with her head turned 45 degrees to the right and held for 30 seconds. Though many people are given medication for BPPV, there is no evidence to support its use in treatment of this condition6. In extremely rare circumstances, surgical options are considered. However, fortunately, in the vast majority of cases, BPPV can be corrected mechanically. Once your healthcare provider knows which canal(s) the crystals are in, and whether it is canalithiasis or cupulolithiasis, then they can take you through the appropriate treatment maneuver. The maneuvers make use of gravity to guide the crystals back to the chamber where they are supposed to be via a very specific series of head movements called Canalith Repositioning Maneuvers. In the case of cupulolithiasis, they would utilize rapid head movement in the plane of the affected canal to try to dislodge the ‘hung-up’ crystals first, called a Liberatory Maneuver, and then guide them out as described above. One maneuver that is used for the most common location and type of BPPV is called the Epley maneuver. However, that will not work for all presentations of BPPV. Often people have tried the Epley maneuver themselves or had it performed on them without success. Later assessment reveals that it is actually a different maneuver that should have been used, or that it is not BPPV at all. This is why caution should be used with self-treatment or with being treated by someone who is not fully trained in identifying the many different variants of BPPV and respective treatment maneuvers. Additionally, before testing or treating for BPPV, the healthcare provider should perform a careful neurological scan, evaluation of the neck, and other safety-related investigations to determine if certain elements of the procedure need to be modified or avoided. This is another strong reason for caution with self-treatment or treatment by a minimally trained healthcare provider. Many studies have been done into the effectiveness of treatment maneuvers for BPPV, with results showing rates of resolution well into the 90% range by 1-3 treatments7 (the more rare cupulolithiasis or ‘hung-up’ variant can be a little more stubborn, as can BPPV that is the result of trauma). It is possible to have more than one canal involved, especially after trauma, in which case your vestibular therapist would typically have to correct them one at a time. You may be advised to avoid certain head positions for a few days following treatment. However, current research suggests that post-maneuver restrictions do not significantly affect outcomes8. Even after the crystals are back in the correct chamber and the spinning sensation has stopped, people can often feel some mild residual sensitivity to motion and unsteadiness, so it is important to follow up with your vestibular therapist so that they can evaluate this and provide home exercise techniques that typically correct this promptly. Unfortunately, BPPV is a condition that can re-occur periodically with long-term recurrence rates as high as 50% within 5 years9, especially in those whose BPPV is related to trauma. If it seems to always reoccur in the same canal and if deemed safe, your therapist may teach you to perform a specific treatment maneuver on yourself. 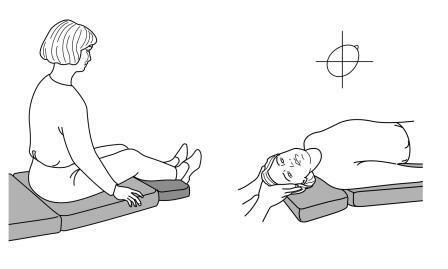 However, it can be challenging to perform the maneuver on one’s self, so many people prefer to return to their vestibular therapist to confirm that they are experiencing the same problem, and if so, determine which maneuver is indicated and provide the appropriate treatment. There are other conditions that can mimic BPPV, and because there are so many different variants of BPPV, the maneuver that worked one time is not necessarily going to be the treatment that is indicated the next time. BPPV is a common problem, and will be encountered more and more as our population ages. The impact can range from a mild annoyance to a highly debilitating condition, and can affect function, safety and fall risk. Fortunately, symptoms tend to decline over time as the brain slowly adjusts to the abnormal signals it is receiving, or because the condition spontaneously resolves. However, with a health care professional who is appropriately trained in the assessment and treatment of BPPV, most patients are pleased that their problem can be easily corrected so their world can stop spinning. Bhattacharyya N et al. Clinical practice guideline: benign paroxysmal positional vertigo. Otolaryngol Head Neck Surg. 139(5 Suppl 4):S47-81, 2008. Froehling DA, Silverstein MD, Mohr DN, et al. Benign positional vertigo: incidence and prognosis in a population-based study in Olmsted County, Minnesota. Mayo Clin Proc 1991;66:596–601. von Brevern M, Radtke A, Lezius F, et al. Epidemiology of benign paroxysmal positional vertigo: a population based study. J Neurol Neurosurg Psychiatry 2007;78:710–5. Shigeno K, et al. Benign paroxysmal positional vertigo and head position during sleep. J Vestib Res. 2012: Jan 1;22(4):197. Fife TD, et al. Practice Parameter: Therapies for benign paroxysmal positional vertigo (an evidence-based review): Report on the Quality Standards Subcommittee of the American Academy of Neurology. Neurology 2008;70:2067-74. Parnes LS, et al. Diagnosis and management of benign paroxysmal positional vertigo (BPPV). CMAJ. 2003 169(7):681-693. Nuti D, Nati C, Passali D. Treatment of benign paroxysmal positional vertigo: no need for postmaneuver restrictions. Otolaryngol Head Neck Surg 2000;122:440-4. Click here to download a copy of VeDA's "Benign Paroxysmal Positional Vertigo BPPV" publication. Click here to view the American Academy of Otolaryngology-Head and Neck Surgery's Clinical Practice Guidelines on BPPV. For more in depth information about BPPV, you may wish to purchase VeDA's book, "BPPV - What You Need To Know" from our online store. "BPPV - What You Need to Know" is for people who have or suspect they have Benign Paroxysmal Positional Vertigo (BPPV) and want to know more about its nature, diagnosis, and treatments, as well as strategies for coping with its effects.